If you didn't already know, in addition to running this blog, I also run a dating blog! I founded Tinder District (blog / instagram / facebook) 2.5 years ago when I moved to DC after college as a way to share the crazy things that happened to me on Tinder dates, and it has grown since then to a place I never dreamed of. Dating recaps have turned into a lifestyle space where I can share advice (mostly humorous, but also serious), book reviews, and more of my personal life. Recently I've partnered with Three Day Rule to do daily recap posts of their 30-Day Pre-Valentine's Dating Challenge, which you can read all about here! Speaking of Valentine's Day, DC-area friends! I'll be co-hosting the Valentine's Day event at Hawthorne, and it's going to be a great time - drink specials, fun activities, and a couple hundred of your closest friends. If you're around on February 14th, stop by Hawthorne between 8 PM and 2 AM to say hey and grab a drink! Facebook invite here. I had some dental work done a couple weeks ago, and had temporary crowns on my top canines for two weeks. If you've never had temporary crowns, they are a) SUPER white, b) made of delicate molding material, and c) make it so that you can't chew anything. So, for two weeks, I was on a strict diet of soup, yogurt, and smoothies - and wanted to kill someone the whole time. I had planned to do a post series all about soups and smoothies butttt that didn't happen, haha. But I'm back in action and have the loveliest smile! If you're in DC and need a dentist, I can't recommend SPA Dental Group enough. Woof! That was a lot. TL;DR I've been a delinquent blogger and I'm about to make that up to you with some dope mac and cheese! I happened to make this right before my dental work (of course), so I was only able to get in a couple servings before I turned it over to my roommates. I loved it, they loved it, and I can't wait to make it again now that I can chew! Kale and sundried tomatoes pack in nutrients, light mozzarella and almond milk keep things on the lighter side, and red chili flakes add a spice that really takes things up a notch. This is super easy to throw together - what are you waiting for?! First, gather your ingredients! 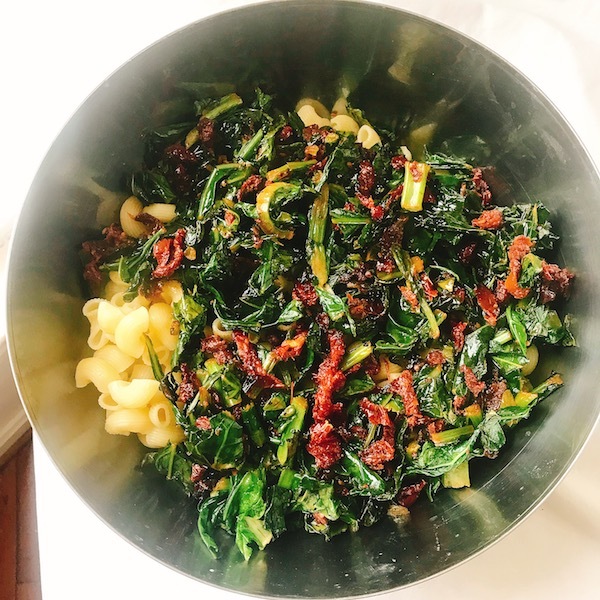 Macaroni (or whatever pasta shape suits your fancy), kale, sundried tomatoes, almond milk, cornstarch, CHEESE, and all the spices (salt, pepper, garlic, red chili) that your little heart desires. Drain but don't rinse your sundried tomatoes - the extra oil will help wilt the kale. Chop them into bite-sized pieces, then sauté them in a bit of olive oil over medium heat for about 2 minutes. Add the kale and sauteé until wilted, adding water to help it wilt if necessary. Once the veggies are ready, go ahead and add them to the pasta and stir to combine. Now we make the cheese sauce! Bring the almond milk and cornstarch to a boil, then reduce heat and stir until thick. Then, add the cheese and spices. Stir until you have a smooth, creamy cheese sauce. Pour the cheese sauce into the pasta and veggie mixture and perhaps take an obligatory cheesy boomerang. I mean, you have to! For the likes. Stir it all up, and adjust seasoning as needed. With that, you're all set! Forewarning: if you have roommates, keep this under wraps. They're BOUND to be scavenging for more!